His words hung in the air; a prelude to a wonderful conversation. Instead, it unknowingly ushered the entrance of a gentleman seeking assistance. He nimbly stepped onto the porch of our wooden clinic, lifted his shirt and wondered if we would remove the fairly sizeable lipoma he was unabashedly showing us. "R", just having successfully completed his year of social service that followed medical school, jumped up and began to guide a promotora, "C", through the gathering of the equipment they would need. Although he is ever eager to lend a hand, I smiled briefly thinking his current motivation might have been influenced more by reptilian factors. He is quick, but I had never seen him move that fast. Just as they were starting their consultation, the woman with the facial lesion decided the time was right. Wanting to reward the kind woman’s confidence in us, we quietly accepted the delay in our planned swim. A recognized her, and she and I began to make our preparations. We had seen the remaining patients and the time was ideal for focusing without the pressure of a full waiting room. “Do you want to help her?”, I asked, hoping my voice hid my concern. Any surgery to the face has always caused me pause. Even carefully done, this particular repair would have a high likelihood of a very evident scar. "A" responded with an enthusiastic “si”, but I saw a brief flicker of doubt in her eyes. Despite my effort, I am fairly certain she saw the same in mine. Had we been in the tertiary care facility I had left three days ago, this woman would have been treated by a specialized surgeon in a sterile operating room. I was comfortable that we would do our best to create a clean environment, but I knew we didn’t have formal training in plastic surgery. So, my thoughts were racing a bit. And it was still hot. The same specialized medical instruction that increases my utility and efficiency within the US, is confining to my scope here. In Colombia, I am frequently reminded of my limitations. I constantly feel the need to keep learning and responsibly expanding my boundaries to keep being a useful physician in very rural areas. I have had wonderful mentorship to guide me, but at that moment, support felt pretty distant. As I was feeling my worries escalate, it was a mentor’s voice I heard kindly but bluntly reminding me, “is there anyone in the immediate vicinity that has more training in this than you?” Ok then. On we go. "A" and I slowly gathered our needed equipment. (How was it not cooling down yet??) The familiarity of this preparation began to diminish my nerves and I was able to collect some thoughts that seemed relevant. As we discussed our planned specific steps for the procedure, I tried to gauge "A’s" comfort. We had worked together intermittently for nearly 10 years. We first met in 2008 when I taught an introduction to childhood growth and development to her class of promoters. Her intelligence and her courage were instantly apparent. She asked thoughtful questions and always seemed to be advocating for others. In the intervening years her attitude toward learning has allowed her capacity as a healthcare provider to blossom. I was so pleased with her personal decision to move away from some of her family to live and work with us in the bigger town where we teach. This choice and her continued dedication have helped found and solidify our local clinic. Additionally, this experience continues to foster her clinical and leadership skills. Working together trying to help this woman, I am very aware we are both a little out of our element. We will lean on each other’s learned skills and together apply them to a new scenario. Although this facial repair was new for her, I saw that she was ready and focused. With the fading natural light, I sat down, put on my head-lamp, gently held the woman’s head and lit the area for "A". With her usual care and attention, "A" skillfully injected the lidocaine and prepared the sterile area. She then donned her sterile gloves and we were ready to start. Nearly forehead to forehead over the woman’s face, "A’s" steady hand gently circumscribed the area with a scalpel. As with any procedure, we were both focused intently on her cutting. In this particular case we were also being mindful not to drip sweat onto the sterile field. Quite the romantic view of surgery. Guiding someone else through a procedure that worried me was fascinating. I was so impressed that "A" could have me watching her every move and still function. I know this is a hefty weight for learners, but at the same time, we have grown to a point where this degree of supervision was more welcome, supportive and empowering than impairing. Some of her work was too deep, some too shallow, but she made careful corrections. We both knew the most challenging part was going to be making sure we approximated the edges well, to decrease the likelihood of a gaudy scar. She confidently placed her first suture, but it didn’t quite sit as well as she wanted. She removed it and started again. This one was closer to perfect than I could have done. It looked great. The edges came together wonderfully. I exhaled with relief. I hadn’t realized that I had been holding my breath. I guess it was pretty loud. "A" looked at me and giggled at my hugely grinning face. She had been more nervous than she had let on too. The remaining sutures fell into place leaving a thin scar which we hoped would heal beautifully. We bandaged the area, provided pain medication and prophylactic antibiotics. The kind patient was pleased we were happy, but left quickly so that she could finish her family’s dinner. Cleaning was a quiet, celebratory ritual. We were both smiling as we mopped the floor and scrubbed the instruments. We had overcome an obstacle and learned together. We were both more prepared for the next time. By the time we wrapped up, the waiting room was empty and dark. We checked in on "R" and "C". During the procedure "I" and a second promoter had entered their consult room to learn the technique. The patient’s wife had come to the clinic to help alleviate the gentleman’s stress. The challenging portion of the procedure was complete and they were just finishing up the sutures. I felt the same emotion here too. People were laughing, sharing this private moment. Some from relief, some from accomplishment, some because they were excited to learn something new and helpful. As she was still learning, "C" had watched "R" carefully, handing him equipment. She had been mentally preparing for the day when another patient would arrive with a lipoma and there would be no physician “in the immediate vicinity.” She would be properly trained and ready. As the last of the sky’s light faded, we finished cleaning the consult rooms and walked together to dinner. We sat on a friend’s porch, eating and reliving the day. We initially were pretty lively and laughing about memorable events that surprised us. As the food came, we calmed a bit and spent time clarifying lingering clinical questions from the day. Just as I was quietly beginning to wonder what challenges tomorrow would bring, "R" apparently still had a lingering doubt of his own. He pulled the owner of the home aside and whispered wondering if she had heard of any alligators in the river recently. Despite the darkness, I could feel "I" roll his eyes and heard his laughter bellow. Sitting there, amidst the buzzing mosquitos, I felt so lucky to have been given this opportunity to be here. As far away as home was, it felt pretty darned close. All is well here, from my own human standpoint…As this trip is to be slightly longer, it had the initial benefit of being better paced, so that I didn’t have to start teaching immediately. I have had a bit of time to organize things from home and get ready for things to come here. I spent the bulk of the week getting the office, equipment and medicines ready to start seeing patients and to travel to communities again. As always, there have been distractions. I am still fairly confused about the state of health care that is being provided in the town where I live, but I am learning more daily. People are really troubled due some recent changes that have made it more difficult for people to get medical attention. We aren’t really equipped to meet those needs in this bigger town, but the promoters in town and I are doing what we can. It is hard to walk down the street, and hear the stories and the general concern all around. And the water is rising again. It is coming up fast. I think last year’s flood left so much sediment in the town that now all the homes seem closer to the ground. When I arrived last week, Main Street was dry; it is currently under water. The planks, serving as walkways, have been reconstructed. This is weighing heavily on people too, especially after last year’s long flood and subsequent destruction. Despite the rising water and difficulty with health care, this has been a week of celebration here. This is the annual celebration of the local patrona, La Virgen del Carmen. Each day a different barrio pays tribute with music, dancing, processions and drinking. All this occurs in the street, as there isn’t a decent common space. I can't begin to describe the dancing here. There are amazing movements to beats I can't hear. It all culminated Saturday with church services and La Virgen taking a spin around the river and though the flooded streets. We have been keeping a low profile, but have enjoyed the festive mood. I wrote this note nearly a month ago. I want to send it along as I am feeling pretty far away. The past month has flown by. The treatment room is functional. The promoters are working in their communities. We are in phone contact with difficult cases. I just got home last week from a 10-day trip to 4 communities. Each time I go out, I learn new things and feel more a part of the work here. I hadn’t been to this particular river in nearly 3 years and it was great to go back. In our absence, the water has subsided slightly. I am currently in a bigger town preparing a course that starts the beginning of September. 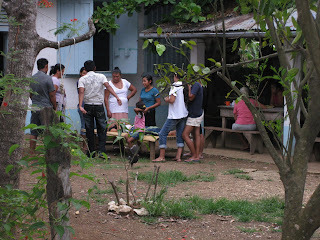 I head back Tuesday and leave for another visit to the communities at the end of the week. Despite its brevity and lack of a catchy story-line, I am going to place this on blogspot. It is challenging to share what living and working here is like, but I love hearing how much people like reading about it. I hope this finds people healthy and well. It is really dark…kind of spooky…probably 11:30ish…I have my head-lamp on with its suddenly dwindling batteries…aside from the 2 small rocks I have ready for angry dogs, my hands are free to wrench the handlebars as my feet stomp the pedals. The rainy season has brought huge, cavernous puddles to the dirt roads. A few families have filled these puddles in front of their homes with dirt and stones, forming lakes of sticky mud with big rocks sticking out like tiny islands. My backpack is lob-sided and stuffed full of medical supplies. I have only a slight idea what I am going to need, have absolutely no idea where I am going, and I am going to wipe out…big. A half hour ago I got a call from the daughter of the cook I described a few letters ago. Her mom, our friend, was pretty sick. She didn’t have a car to bring her mom to us at the house, so I am on my way to her. After getting the call, I woke up M, the promoter living in our home. She couldn’t describe where I needed to go, but thought maybe she could find it, if she saw it. As I had examined our cook in clinic just after lunch, I knew she was sick. I had recommended that she go to the hospital immediately. With money, transport, and uncertainty in the medical care in the hospitals, especially during the late afternoon, she opted to sleep in her home and go to the hospital early in the morning. Apparently she had gotten worse, and she really looked lousy 9 hours ago. M pulled her hair back with a band, and without changing from her pajamas, was ready to go. I put on some clothes, threw things into a bag, grabbed the car keys, and my license. We ran out the screen kitchen door. Empty driveway. Definitely a “crickets chirping” moment…we looked at each other…I ran around our classroom building because sometimes the promoters leave the trucks there. Empty. ”Bikes! Get your headlamp…” I said to my promoter friend as we ran back into the house. The promoter that lives here is a wonderful woman and a great medical provider, but I completely forgot she is just learning to ride a bike. I remembered this the moment I sped down the driveway, flew into the street and waited for her to call out a direction. More crickets. She persevered bravely, but fell pretty badly and soon after leaving the driveway as the roads were in atrocious condition. She tried to keep going, but her frustration broke through her universally pleasant demeanor. “Forget this…I am waking people up…I am going to find the cars…” Then she groaned as she remembered she used up her most recent pre-paid phone card and couldn’t make a call…I gave her my phone to call our colleagues. As I was really nervous about the time that had already passed since the initial phone call, I asked her where to go. She quickly said “al tope!”. (which means to the very, very end (of the road).) hmm…I jumped on my bike and sped off to "the end of the road". And I kept going. 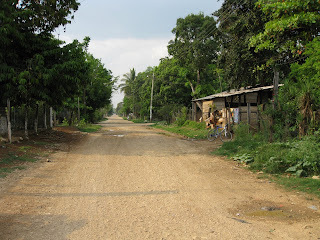 The road got smaller and more overgrown, the houses got further apart. When the road ended in a mass of trees and brush, I figured I had probably gone far enough. No one was waiting, no lights were on. It was dark. I raced up and down streets. Got chased by dogs. Nearly hit some goats(??) laying in the road. I think they were goats. They didn’t bark. It sort of felt like I was treading water in shark-infested waters…biding time until I found the house or received an inevitable mugging or dog-bite. Meanwhile la pobre promotora…using my phone, she was unable to reach anyone. No one answered her calls. Stuck and getting more desperate, she started pedaling to the center of town. She cautiously approached some people working for a traveling fair that is currently on the town park-center. She got afraid and thought better of asking for their help and pedaled away at the last instant. With a fleeting thought of waking up the padre in the local Catholic Church, she opted for people she knew should be awake and had transportation. “La policia!” (I need to say the civil war here really changed how the public view government agencies like the police and the army. This relationship is vastly different and does not contain the innate trust people in the US have for people in these official groups. This was a big step.) On her way into the police building she had to walk through a group of armed soldiers. “There is a sick woman and we are trying to get to her house. It is an emergency. Can you help me?” They began to ask her some questions to clarify the situation in their minds. “Who is sick? What is the problem? Where does she live? What is her last name…”As we never use last names here, my friend had no idea about our patient’s last name. She was winded and probably not very convincing. Her interview didn’t go over too well. I suppose the fact that she was obviously by herself and kept using “we” didn’t gain her much confidence either. They sent her inside to talk with the police. Covered in mud from her bike falls, limping with a bloody knee, hair and pajamas askew, the promotora raced into the police station. In her excitement she didn’t identify herself and went right into the story. “You are drunk aren’t you?”… ”What?? No!” When she mentioned where she worked they relaxed a bit and listened to her story, which she fired off rapidly, with growing concern. She knew someone was sick and that she had sent me in the general direction of “al tope!”…”Are you going to help me?…there is bleeding! If you aren’t, I’ve got to figure out something else to do”…The police agreed to help, and she reiterated that she wasn’t completely sure where this house was. They climbed into the big pick-up quickly headed back to our home. “Ahhh! Where are you going? Her house is that way!” I guess they still weren’t sure about her sobriety and decided to dump her back at our house and be done with the whole event. I don’t know what was said, but they finally agreed to turn around and help her search the town for our sick friend’s home. ”Hey! Yep, yep...that is my friend!” A voice erupted from the backseat. The promotra, who had been describing a here-to-fore fictional back-pack-laden, bike-mounted North-American with a head-lamp sat back and smiled in her instant credibility. I threw my bike in the back of the truck and we headed off. “I didn’t tell you where it is yet…”…Though his lucidity improved, he didn’t end up finding the letter nor the number. But the daughter of the patient said she might know where the driver’s home is…everyone ran out of the house, leaving Doña C., her husband, and me alone. I started fluids, checked vital signs and arranged her for transport. I looked around their home. They lived rustically; they had a roof over their head and they had each other. The husband entered the one-room home and I realized he was dressing up to go to the hospital. He was tucking a clean, pink, collared shirt which had frayed elbows into a pair of thread-bare pants. He looked at me as he tried to arrange his hair in the mirror-less room. “Thanks for coming to help.” Something about the man dressed in his nicest clothes, in his dark home as I am preparing to send his wife to the hospital really resonated with me. This man and woman are poor for reasons outside of their control, but have maintained their dignity, kindness and generosity. I don’t know how I got so lucky to have an opportunity to be here experiencing real life in a different culture. I also am not thankful enough to have been given the freedom and the opportunity to make choices in my life and to pursue a career that I want to follow. I was pretty shaken. After another short discussion, we learned that C was using the proper first name of her partner in cooking, that few people ever called her. We kissed her and closed the ambulance doors. We were dropped off at the main road. The truck continued off toward the hospital as we finished the walk home and quickly passed out asleep under our mosquito nets. been waiting…in her doorway, watching the dirt road, packed bag at her feet. speaking of bug bites…the last time I wrote a really quick tease of a message promising a night off and internet…we had just wrapped up a course for the advanced promoters…I spent the last hour talking about jaundice and Rh isoimmunization…I couldn’t believe it went as well as it did…I was terrified...after getting back to Flores and doing some grocery shopping, things spiraled downward…pretty quickly I started feeling lousy...I went to bed early thinking I was tired…I woke up and immediately knew all was not right….I got the 5 am bus back to our clinic, and was sent to bed on arrival…although there were people keeping a close eye on me, the fevers came late that night…as that was a clinical change, I dragged myself out of bed, shuffled across the yard to the clinic, through an amazing rainstorm (I am not making this up…I swear), I poked myself and took some slides of my blood, and started treatment for malaria. I couldn’t think of anything else that fit my symptoms and for which we had therapy…due to my delirium the slides didn’t turn out very professional(ly?) nor polished, but they were enough, in combination with my slow improvement with treatment to suggest malaria as the diagnosis (although I had been taking prophylaxis…just like my concussion-causing face-plant despite my cranio-protective helmet)… I started to have a glimmer of hope after 3 days of chloroquine, by 5 days out I felt pretty much back to normal…although a colleague found some rum raisin ice cream on day 3 as well, so I am holding out for that as the amazing cure-all…god it was good. On the plus side, I had 3 days where I didn’t have strength for anything but reading…initially I couldn’t focus on much besides trashy crime novels, but as I started feeling better I read more and more challenging books. I just finished Confessions of an Economic Hit Man by John Perkins. I thought my work abroad would teach me about medicine, Spanish and local culture. I should have been more aware, but wasn’t, that this would include an education in US foreign policy, as it relates to Latin America. Although the bulk of this book took place in the 60s-80s, it is completely pertinent to the situation and the present culture here. It puts some recent current events in a different light (referring more to the present coup in Honduras, and less to Michael Jackson’s demise). After a five-year hiatus, I just restarted Gabriel Garcia Marquez’s Love in the Time of Cholera. I don’t know if it is the Colombian setting, the story or the style, but I am hooked. What I remembered as a dreary story about a man suffering from unrequited love is still about that, but I am laughing more and enjoying the wording and the characterization much more. There is an expression in Spanish “me cae bien”. (I hope I am not repeating myself…I looked in some older notes to see if I have described it before, but I didn’t find anything…)…it means “to fall well”. medicines, people, events can all “cea” bien o mal (poorly)…a medicine that works and the person gets better “falls well”, whereas a medicine that causes an upset stomach or doesn’t make the person better doesn’t “fall well”. this is a huge reason people stop treatments here. this can happen minutes after the dose, regardless of the medicine and hereafter will always happen…it sort of removes any blame…My point is that for some reason the book seems to be falling much better this time than it did the last time. I guess it is the way I am looking at it...or, alternatively, maybe it is because this edition has Oprah’s approval on the cover. Oh god. quick question…does anyone know what I am supposed to do about ants in sterile fields?...The other day in clinic I had anesthetized, cleaned and prepared an area around a cut and was focusing on closing a wound (and trying not to drip sweat onto the work space)…slowly, approaching from the corner of my vision…an ant ambled from the picnic table up onto the patients arm, onto the drape and into the wound…he or she was completely immune to my efforts to blow him away or at least off-course…there was an admirable determination there…Flies I can understand, sure…but an ant seemed more intrusive somehow… I grabbed it with a pincer and chucked them both…can anyone send me any evidence-based thoughts or strategies?? 6am and all is well. I have a steaming cup of coffee as well as a potential day off, in front of me. I can’t believe I have been here a month. The constant exposure to new illnesses and problems has broadened my knowledge and made me feel more confident. When I am practicing here, it is humbling to realize, on a global scale, just how limiting a formal pediatric education is. At home, I can’t think of a better job for me, but here, I encounter so much that I haven’t seen since medical school…Jumping from one environment to another has kept me on my toes. This is my second 6-month stint volunteering with health care promoters. Last year I spent my time in Colombia, and now I am in Guatemala. Both sites are affiliated with a non-profit organization in California, Concern America (concernamerica.org). Concern helps find volunteers and supports programs around the world. The programs themselves are run locally in the specific country by people from the area. Health care promoters form the basis of an effective health system especially in geographically challenging regions were finances, and distribution of medical care is scarce. They are lay-people that are elected by their communities to serve as the local health provider. We are one of a few groups that educates promoters, helps establish sustainable and affordable pharmacologic access, and acts as a consult service for more challenging cases. 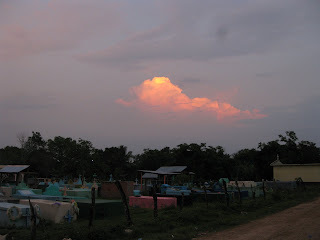 The educational site in Petén has been functioning in this capacity since the mid- 1990’s. In addition to teaching classes to the learning promoters, we also teach advanced courses to sustain and improve the abilities of the promoters who have been practicing for years. Some of the advanced promoters also learn how to teach and slowly take over the teaching of the newer promoters. Above the lectures we also have clinic 4 times a week. This not only serves the local people here, but also, more importantly, allows more experienced promoters and asesores (me) to work alongside learing promoters and teach along the way. There are many parallels between my work here and the learning and teaching I do with medical students and residents at the children’s hospital in Salt Lake City. I love waking up early the days when we have courses here. Two wonderfully colorful older women arrive the night before to start preparing food for the promoters coming to learn. 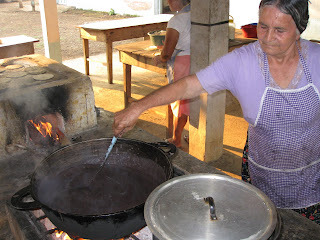 They get wood and start the fire, begin to cook the beans and corn and also prepare homemade chili (hot sauce). 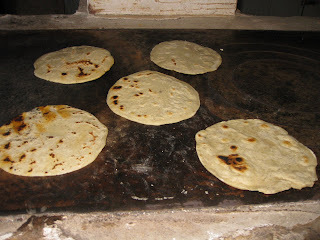 On the day of the course, the corn gets ground into masa, shaped into tortillas, thrown over the heat and eaten…Hot off the comal (a flat grittle-like metal surface). As of now my tortillas have steadily improved, but I am still WAY behind the curve. Not only am I on the slow side, but also my pre- and post-grill tortillas are misshapen with sub-optimal thickness and uniformity…kind of like the ugly ducklings of the litter…the kind ladies move my “art” a little to the side, I think they want consumers to know these tortillas were clearly not their product or responsibility. The Spanish verb for this act is sensibly “tortillar”, well, it is when done properly, I think the word for what I do is probably too obscene to print. As I mentioned in the last blog, I am feeling like a kid in a candy store in the clinic. We are responsible for everything. From history taking, vital signs and the exam to laboratory evaluation, microscope studies and treatment. It is really fulfilling. Especially when you realize that we are teaching people to do this in their home communities, far from more official care. I mentioned that people come from all over and at all hours. The environment is stressful, as there is not defined “down-time”, but it has formed a cohesive unit for the people that live and work here. There is partnership in everything. Clinic wound down and we were cleaning up from lunch. I was in the yard when a young girl ran around the corner of the clinic. “My friend just took a medicine and now she blew up like a balloon and can’t breathe.” Hmmmm…sure enough. A miserable looking, swollen-faced teenager came surrounded and led by a large group of family and friends. I have never given epinephrine for a severe reaction before; that usually happens before I am involved. For awhile, I think my heart was racing faster than hers, I was certainly sweating more. I gave it and she gave a massive inhale/gasp…I nearly fell over…was that a good gasp?? a REALLY bad gasp?? then her mouth turned up into a smile and her eyes lit up below swollen lids…ok, kind of romanticized, but it seemed that way to my relieved self. Her friends relaxed and there was a social gathering outside the clinic around her cot. Teenagers and family just hanging out, talking about their swollen friend. We watched her for 45 minutes, gave her meds and education about allergies and sent her on her way, with instructions to come back quickly for any signs of repeated swelling or problems breathing. I remembered the older lady. I asked my colleague the way to the cemetery, she told me she lived there…next to it at least…”alongside” being the critical part). She told me to go straight down the street all the way and then turn right. This was much more funny at the time, but the word for straight and right are so close in Spanish, that I got pretty lost. After a completely meandering course, I found her home eventually. Her husband was outside and concerned. Her fever had stopped, but her diarrhea had gotten a bit worse and she had started vomiting. When I asked for a poop sample earlier in the day, I had a nagging feeling the container might be an issue. 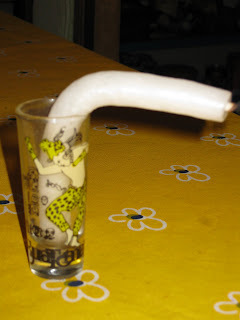 The family had cut off the bottle of a clear soda bottle and tied a piece of paper to act as a cover. She actually looked a little better. So there I am…riding down a rocky, dusty dirt-road on a tired bike with 2 half-inflated tires…one hand on the handle-bars and one holding a crinkled, worn plastic bottle containing what I hoped were answers. I was avoiding the jarring rocks and divots in the road, gazing at the purples and oranges of the sunset, and balancing the slushy sample. I was actually feeling really content. I swerved to avoid a toddler learning to walk. I approached three dogs that began to eye me fairly ominously. “no way”…yep…All three simultaneously erupted with bared teeth, aggressive barking and nipping at my heels. “really?! ?”…As I stood on the rickety pedals, the sample somehow did not leap over the edges and I managed to stay vertical and just far enough ahead of the dogs to make them loose interest. I arrived home feeling like I needed to finish my work with the sample before I ate dinner. It made sense at the time. As I was looking under the microscope, one of the cooks tapped me on the shoulder and gave me a big hug. “don’t forget to eat.” The sample looked ok, nothing too ominous. I would go visit tomorrow morning. I washed my hands at the outdoor sink (pila), and turned around. The cooks had left my black beans, cheese, steaming tortillas and coffee on a plate next to the smoldering fire.